As quick as you can push two buttons—this Air Pineapple Peeler/Corer cores and peels pineapples in one swift movement. 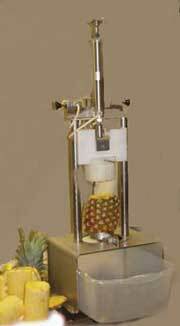 To operate, place top and tailed pineapple under pusher and press switches to active the air cylinder. This pushes the pineapple through the blade to perfectly core and peel each pineapple. Up to 10 pineapples per minute. Includes 3 1/2” coring & peeling blade and pusher.